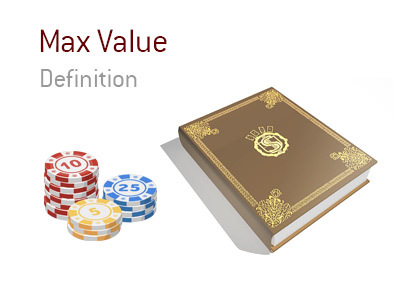 What does the term "max value" mean in the world of poker? What is the definition of the term "max value"? In poker, to get "max value" means to extract the maximum amount of chips possible from your opponent. For instance - let's say that you are playing in a home cash game with some of your friends. You are on the button. There is an early raise, and you decide to re-raise once the action folds around to you. The early raiser calls - based on how they have played so far, you are almost certain that they are on a hand such as K-Q. You are holding pocket Aces. The flop comes K-3-4, which is likely a very good flop for your hand, as your opponent may have gotten a big piece of the flop. Your opponent checks. You bet, and he calls. The turn brings another 4, which almost certainly doesn't help your opponent's hand. Again your opponent checks. You decide to put out a 3/4 pot bet and he calls after a moment of thought. The river brings yet another 4. Your opponent checks once again. There are a fair number of chips in the middle, but you need to carefully consider how many chips your opponent will call on a river bet, as you are certain that you are ahead in the hand. You decide to put out a 1/2 pot bet, which your opponent quickly calls. You flip over your pocket Aces, while he turns over his K-J. You take down the sizeable pot. In this situation, you were able to get "full value" from your opponent, as you managed to extract the maximum number of chips possible without him folding.